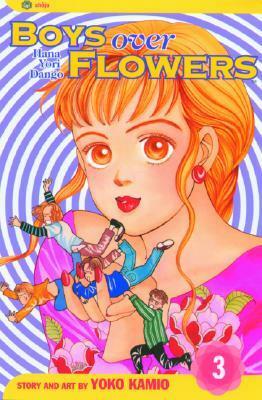 Volume 3 of Boys Over Flowers has some questionable issues that makes it a hard volume to like. And yet I still find it an interesting series. A lot of the volume is your standard melo-drama. All the kids are at a party at a resort. Domyoji and Tsukushi accidentally kiss. Tsukishi is absolutely horrified that she wasted her first kiss on this person she hates, especially since she didn't mean to kiss him (this is a theme I've seen in other manga too). Rui is embarrassed that his beautiful friend/crush realizes that he also has a thing for Tsukushi. He either tries to seduce Shizuka or she tried to seduce him - it was a bit confusing. Then Domyoji makes trouble for Tsukushi, telling everyone that she was all over him and that she's the laughing stock of the party, when in reality he's fascinated by her. Then school starts and it's back to the old bullying. Only much, much worse. Someone tells Domyoji that Tsukushi secretly likes Rui and she only came onto Domyoji to make Rui jealous. This makes Domyoji completely insane with fury (and jealousy). He beats a guy nearly to death for no reason. And then he confronts Tsukushi. This is where the volume becomes disturbing. He hits her and then starts groping and kissing her while Tsukushi is shouting at him to stop. Suddenly he does. He's instantly apologetic and basically assures her that he'd never hurt her, that he's not that kind of guy. I feel like Domyoji is being presented as a type of hero in this manga series. Obviously a complicated and cruel one, but a crush-worthy guy nonetheless. And I find it very troubling that a guy who would try to assault a girl could ever be presented as a hero. Still, I'll keep going with this series and see how it ends up. I never really liked this series. I've watched the live action adaptations of the Taiwanese, Korean and Japanese versions, and even the anime version (my sister and mom liked to watch them so I had no choice). I don't hate it either though... I guess I'm just neutral about the series as a whole but I do hate Domyoji's attitude. I've always been a small fan of manga, I run an anime club at my library but the kids know so much more than I do. Doing Manga Monday will help me catch up to them. Have not read the manga but I have watched the dorama which I find really entertaining. You know, for the longest time, I kept seeing Boys Over Flowers, but couldn't get past the art work since it is a bit more old school. Not as old school as all the afro heads on the guys, but not sleek like the newer books. For some reason, though, I picked it up and it was all over. This was such an addictive series and then I had to get the anime on DVD. Yes, I find Tsukasa fascinating and troubling for the same reason. He is cruel and arrogant. Has temper tantrums many times yet he can be incredibly sweet. I don't know if you can ever justify his actions once you get a better sense of his upbringing. I think Tsukushi is smart by being leery of him.